Data from approved health apps will feed directly into personal health records, Health Secretary Jeremy Hunt has announced. Patients in England will also be able to enter symptoms online and receive tailored advice or a call back from a health professional. The NHS.uk website will allow patients to book appointments, access medical records and order prescriptions. The initiatives are part of moves towards a paperless NHS. It was announced in February this year that £4bn had been set aside for the IT initiative. The new online triage system is part of an expansion of the current NHS 111 non-emergency phone line service. The service is being developed with leading clinicians and will be piloted before the public can use it. The re-launched NHS website will also allow patients to compare how well their local health services perform in areas of dementia, diabetes and learning disability services. Data on maternity, cancer and mental health data will be added in the autumn. 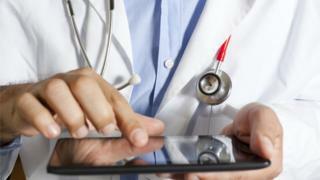 The site will also have a new collection of NHS-approved health apps to guide patient choice. "I wear a Fitbit, many people use apps. What is going to change with apps is the way that these apps link directly into our own medical records. "And by March next year NHS England are going to publish a library of approved apps in areas like mental health and chronic conditions like diabetes. "We will also in the next 12 months be having a competition because we think we need better apps than the ones that are available in the market. "We don't want to develop them ourselves but we want them to be developed by entrepreneurs who have the specialist knowledge and creativity to do this. "These will link into people's medical records." In 2012 ministers had promised that within three years patients in England would be able to book GP appointments and get test results online. In 2013 Mr Hunt said he wanted the NHS to be paperless by 2018 - with the first step, giving people online access to their health records supposed to be available by March 2015. A report suggested better use of technology could allow £4.4bn to be put back into the NHS.